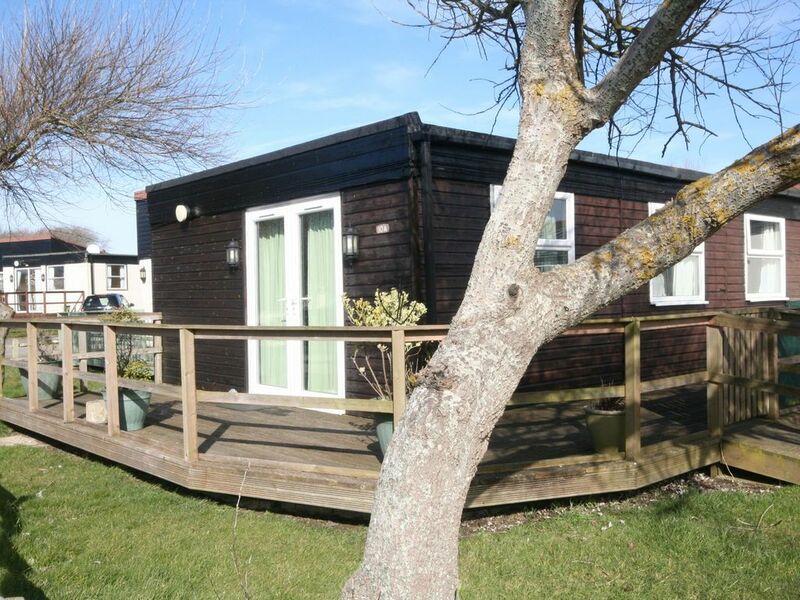 Situated in the pleasant landscaped site that is Medmerry Park, short walk to the sea of Bracklesham Bay - Sleeps 4 to 6. A privately owned site of approx with 308 chalets linked/terraced (60 acres+) ponds/wildlife, dogs are welcome. Children's adventure area, parking short distance away, grassed flat surroundings for biking and walking. There is an outdoor heated swimming pool open from May through September. The beach at Bracklesham Bay consists of pebbles and wet sand when the tide is out. Its an unspoilt beach where you can walk for miles. To the right is Bracklesham, East Wittering where it turns to sand, West Wittering, East Head where it turns to sand dunes and round the corner into the Area of Outstanding Natural Beauty of Chichester Harbour. To the left heads in the direction of Selsey. This will take you onto the Medmerry Wetlands run by the RSPB if you take a left at the rocks off the shore. This will meander around a horse shoe arriving on th edge of Selsey. This chalet is clean, comfortable and equipped. Comprising of lounge/diner with bed settee in the lounge. Dining table chairs, TV, video, French doors, Parking, Outside decking for sitting on those hot summer days and evenings. The kitchen leads from the lounge and is well equipped with electric cooker, fridge and microwave, washing machine etc. 1 double bed, 2 single beds and settee in the lounge. Bathroom has bath/shower, basin and toilet. Price start from £264 per week. We are a Christian couple that let this property through our company. We have other properties let we let for other people. We live in Bracklesham and have been letting this property for nearly 18 years. Location, location, location. It is all about location and this area is great just to chill out for a few days or have it as a base for touring this beautiful region. The property is on a tranquil site and sitting on the decking on a balmy summers day you could be anywhere in the world. Bathroom has bath with shower over, basin and toilet. Wifi is available in the property and also in the site pub. Fully fitted and well equipped kitchen. Oven, hob, integrated fridge, integrated freezer, microwave, kettle, toaster, washing machine and stainless steel sink with single drainer. Crazy golf on site and golf courses not far away. Open May to September, heated outdoor. part of the site swimming pool area. Pebble and sand beach a short walk away. Flat landscaped site easy for walking cycling. Boat slipway 1.5 miles East Wittering, West Witterings sandy beach and water sports. Butterfly farm Earnley. Selsey. Goodwood race course & Revival meetings & Festival of Speed. Bosham. Cinema, Cathedral and Theatre, Chichester Marina. Southdowns, Arundel Castle. Falconry. Chichester Marina/Harbour Tours. Portsmouth. Brighton. Bognor. Isle of Wight. Emsworth. Pagham Nature Reserve. Fishbourne Roman Palace. Cass Sculpture Foundation. Sir Patrick Moore South Downs Planetarium & Science Centre. Chichester Ship Canal. Weald & Downland Open Air Museum, & Much More.